Background: Aesthetic skull deformities are common of which plagiocephaly is the most well known. Also called cranioscoliosis the natural oblong shape of the skull is twisted with the back of the head being flatter on one side. 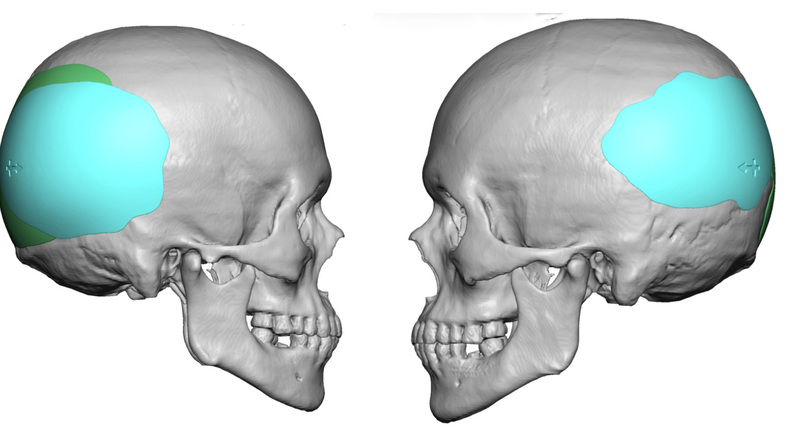 Such shape deformities are best treated by a custom skull implant made from the patient’s 3D CT scan. It is hard to find a better match to the larger left side than what the computer program creates through a mirror image approach. In rare cases of occipital plagiocephaly correction, correcting the flatter side and improving back of the head symmetry may not ultimately be aesthetically enough. 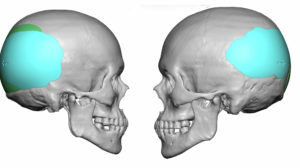 Once the back of the head is made more symmetric the patient may notice other skull abnormalities that they want secondary corrected. These new desired changes may overlap where the prior custom skull implant was placed. This raises the question of whether one implant can successfully be laid over an existing one. Case Study: This young male had a right occipital plagiocephaly that was previously treated successfully with a custom skull implant. It was placed through a small horizontal scalp incision which had healed beautifully. 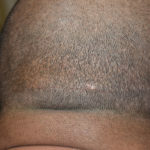 When he had now had good symmetry of the back of his head, he desired augmentation of the parietal and posterior temporal areas to give him increased head width. 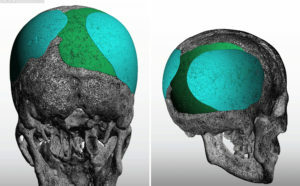 Using his original 3D CT scan and location of his prior implant (in green), new bilateral custom skull implants were designed to achieve his aesthetic head widening goals. Under general anesthesia and in the prone position, his existing occipital scalp scar was reopened to place the right implant. 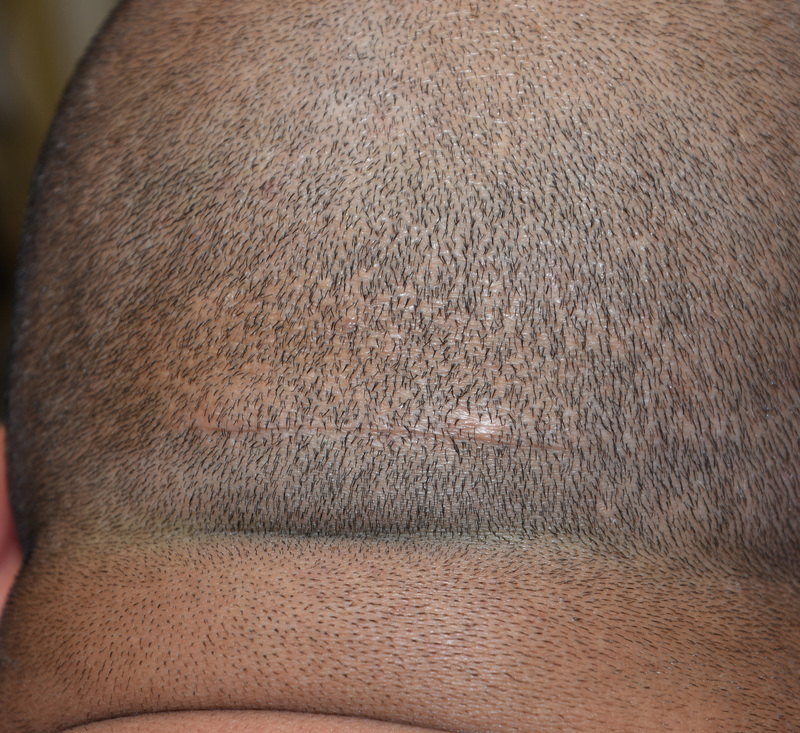 Using an existing scar on his left side, the left custom skull implant was placed. Secondary skull augmentation can be done by placing new implants over existing ones. Once inside the prior implant’s capsule the new implant can be partially or completely over it. 1) Custom skull implants are the best option for treating occipital plagiocephaly. 2) A secondary skull augmentation procedure can be over existing implants with new implant designs. 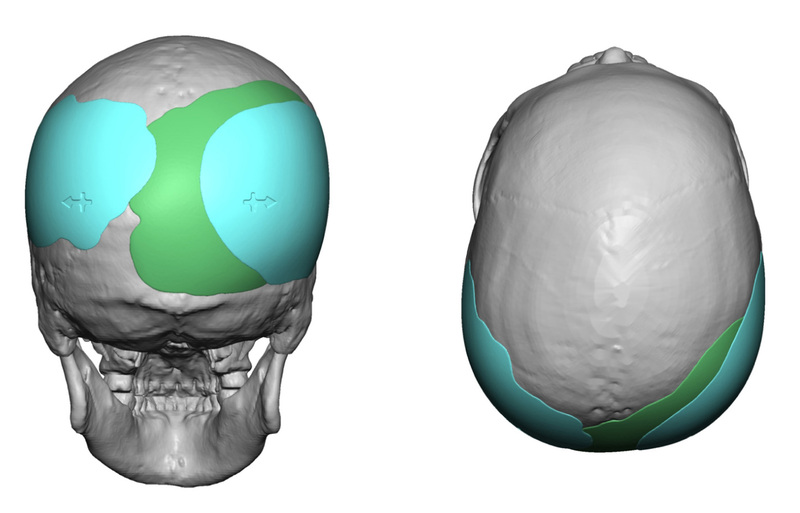 3) A new custom skull implant can be overlaid on top of and existing one.